Do you have enormous wish to live somewhere at the Adriatic coast where you could enjoy mild winters and hot summers under your own olive tree, drinking cold wine and smelling Mediterranean herbs and the salt from the sea? If you are the one who is planning to buy an apartment, an old stone cottage house or maybe luxury Mediterranean villa somewhere in Istria (Slovenia or Croatia) in the future, some advice from my side maybe could help. Perfect location in the Central Europe with good highway connections (it takes you only few hours to get to Venice, Munich or Vienna) and beautiful scenery with Julian Alps and Adriatic Sea make this area very attractive. Slovenia is member of the European Union (since 2004), Schengen area, Eurozone and NATO and has adopted Euro (€) in 2007. 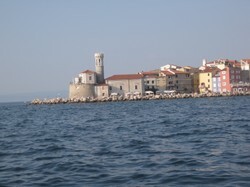 You can find more information about Slovenia in another article, called Best Slovenian tourist attractions. Because of all those facts many foreigners, especially Europeans, have recently bought some real estate here. For those who are planning to do the same maybe some advice from my side could help. What do you have to consider before making the first step? After you decide to buy a house, apartment, villa or land especially in foreign country, you should maybe consider some aspects, which are explained in next paragraph. Buying a real estate in foreign country, especially if it is going to be used mostly for holidays and weekend’s activities, has to be considered from different perspectives, such as legal, economic or social. As some of those perspectives can change during the time it is of no use to get into details in this article. I strongly recommend finding updated information on all of the perspectives below. My purpose is mostly to make a list of different aspects that could be useful when buying some real estate. It doesn’t matter if you buy a house, apartment, land or villa. And it doesn’t matter if you buy it in Istria or anywhere else. It can happen that you find your dream house, apartment or even villa and the purchase price seems to be within the budget. But, are you sure that you haven’t missed something? Is VAT included in purchase price? What is the rate of (money) inflation in that country? Social perspective is very important as you are going to spend a lot of time in your new house! Some countries have certain legal restrictions when foreigners are trying to purchase an apartment, house, villa or any other real estate. There are still many other things that have to be considered for making your new stay full of joy. Transportation is definitely one of those issues. For example if your new dream location will be used mostly on weekends you should know how easy you could reach your destination. That is why the transportation issues should also be important. If you travel by car you should know how local streets or highways networks are developed, do you need vignette and so on. If you will use occasionally airplane, you should consider international airports, low-cost airlines, the distance from airport to your destination. Maybe you are the owner of a boat and would like to know if there are some ports or marinas that can be used. Renovation. You should consider whether to rent local or foreign craftsmen, their availability, professionalism, availability and the cost of the material, the quality of other services and so on. I hope that you have found this article useful. I believe that many of these tips should be always considered, not only when buying your dream real estate in a foreign country. Despite all the words that were written above I would like to stress my final and the most important advice. The purchase should be done with your hearth! Would you like to write articles, too? Use these perfect and simple tools on Wizzley community and become on-line writer. It's FREE, fun and you can make some extra money, too! Thanks for all the tips you provided.